Hugo von Hofmannsthal at 19 in 1893. (Wikipedia.) Click to enlage. Last time, we looked at a German who was a prominent member of the first generation of poets to write in vernacular German. Hofmann von Hofmannswaldau lived during the greatest physical destruction of Germany (before the twentieth century) but because he was connected with the Austrian victors, he and his poetry were little affected by the catastrophe. Before he devoted himself to the stage, Hofmannsthal was the preeminent poet of fin de siècle Vienna. If fin de siècle Vienna is what is on the other side of a giant wall separating overly refined, highly wrought Romanticism from Modernism, then Hofmannsthal never made it to this side of the wall. He had no interest in making the attempt. In this respect he resembled Strauss, who never ventured into the new music. But Hofmannsthal haled from Vienna, where Klimpt, Kokoschka, Otto Wagner, Schoenberg (at the time Schönberg), Berg and Webern, and others were all at various times and to different extents midwifing modernism. And of course, the man who discovered and interpreted the unconscious irrationality of humanity, the aspect that would form the basis of modernity’s view of us, Sigmund Freud, was just beginning to publish his views at the turn of the century. This collection of cultural radicals produced an intellectual revolution as fundamental as anything since the Renaissance. But Hofmannsthal would not be a revolutionary. Cafe Giensteidl sometime before 1897. Photograph by Carl von Zamboni for he illustrated newspaper Die vornehme Welt. From collection of Vienna Museum. It’s even more curious, at first glance, that Hofmannsthal did not join the radicals given that he belonged to something of the literary vanguard, the Jung-Wien (the “Young Vienna” movement). 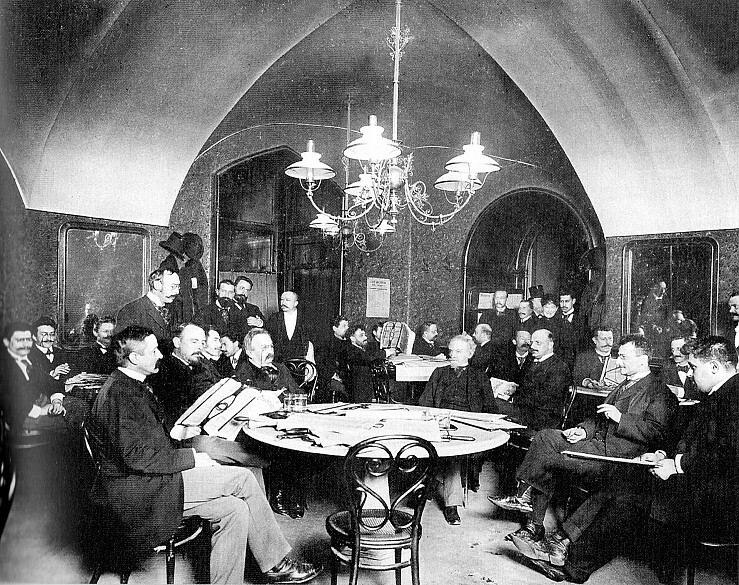 This group of writers of literature and criticism gathered in coffee-houses, under the leadership of playwright and critic Hermann Bahr. The manifesto involved the death of naturalism. Their principal haunt was the Café Griensteidl until it closed in 1897. It was at these meetings that Hofmannsthal met Arthur Schnitzler (who was a member) and Stefan George. After the café closed, the club soon ended, and so did Hofmannsthal’s poetry career. 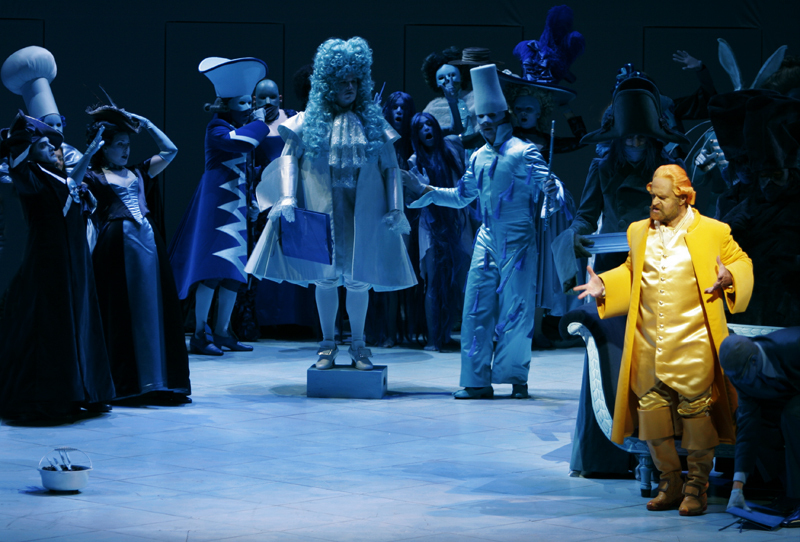 The 2005 production of Der Rosenkavalier by the Los Angeles Opera,. Production directed by Maximilian Schell. Hofmannsthal’s poetry is filled with symbols, although he was not a Symbolist. It is true that Hofmannsthal said that his most important influence was Stefan George. Hofmannsthal said of George: “He so completely conquered life, so absolutely mastered it, that from his poems the rare, indescribable peace and refreshing coolness of a still, dark temple are wafted upon our noise-racked senses.”4 George himself was closely affiliated with Mallarmé and Verlaine. But the symbols in Hofmannsthal’s poems were not the flamboyant dressings to the obscure referents of an aesthete. (See for example Mallarmé’s “Tristesse d’été,” which I translate and comment on here, although that poem is hardly the most gaudy of the output of the Symbolists.) Rather, Hofmannsthal’s symbols were the images steeped in primal meaning, the ones that float in our dreams. And as we’ll see in today’s poem, the verses themselves are dreamlike, tightly written, with simple, recurring vocabulary, and as in the most haunting dreams, the symbols transform themselves with new uses in order to suggest more fully their meaning. Stefan George, photographed in 1893. Click to enlarge. As for Stefan George, who published Hofmannsthal’s poems and even portions of some verse plays in his Blaette fuer die Kunst (the journal had highly stylized orthography), while Hofmannsthal admired his meandering, flowing lines and his hazy images, Hofmannsthal did not subscribe to belief that art was something spiritual or a substitute religion. And he certainly did not believe that the artist was a high priest, as George thought of himself. Hofmannsthal thought of art as a way to truth and never confused it for truth itself. George’s mistake in this regard is why he became (against his own intention) a favorite of Nazis later on. And despite Hofmannsthal’s fondness for George’s poetry, he didn’t need George to show him the work of the Symbolists or any other modern writers because he knew them before they met. Weiner Akademisches Gymnasium from Moritz Bermann, Alt- und Neu-Wien: Geschichte der Kaiserstadt und ihrer Umgebungen (Vienna: U. Hartleben’s Verlag: 1880). Click to enlarge. Perhaps the most astonishing thing about the debut of this new Goethe was that he was 17 at the time, and he would complete his entire poetic career before he was 25. And in none of the poetry is there any trace of immaturity, confessional egocentrism or mawkish sentimentality. Broch attributed Hofmannsthal’s remarkable poetic maturity to his being a “Wunderkind, wunderschauendes Kind“7 (a prodigy, a marvel-gazing child). Aside from the poetry itself , Broch has only thin biographical evidence to support that conclusion. But what anecdotes he has, he spins into a cultural psychoanalysis which places Hofmannsthal near the turning point of nineteenth century European culture and also explains him in a way that a modernist of Broch’s preeminent rank can empathize with. Hermann Broch in 1937, one year before his arrest and then escape from the Nazis. © Österreichischer Bundesverlag, Wien. Click to enlarge. Death mask of Hermann Broch. Beinkie Library, Yale University. Hofmannsthal’s life-long use of dream motif was Broch’s principal connection with a man who he otherwise had little interest in. When Broch was first asked to provide the introductory essay to a collection of Hofmannsthal’s writing, he accepted only because he had no other position (his hoped for job at Princeton never materialized). He thought of the project as “financing 1948,” but otherwise found the prospect “repulsive.”13 Broch was living in New Haven trudging away at his “life work,” a study, which he began in 1941, entitled Mass Psychology which attempted to explain the popular appeal of totalitarianism by means of a social psychology rooted in a version of Freudianism (or at least using basic Freudian concepts). Broch’s interest in social psychology pre-dated his own fiction (he published articles first stating his theory of cultural values during and right after World War I). His view of the value of (indeed the morality of) art drastically changed over his life. When he wrote the Hofmannsthal essays, he had concluded that literature no longer provided the means to examine the ethical basis of our time. Nevertheless, his two major novels (which attempted such a task), both relied on dream concepts for their organization, narrative and message. The Sleepwalkers used unconscious sleep state as the unifying concept of the three novels. The Death of Virgil, completed only after he had escaped the Nazis, is an elaborate dream-hallucination rumination of the meaning of life and art on the Roman poet’s last day. The unconscious life made evident through dreams thus informed all Broch’s works in all the disciplines he attempted. But is his explanation of Hofmannsthal’s dream poetry valid? The brief biography he gives can of course be interpreted many ways. The use of later theater works to explain young Hugo’s childhood psychology is not outlandish. Freud used the fiction of writers to explain their own psychic makeup, usually coming to conclusions at odds with biography, however. Broch’s attempt is at least as good as Freud’s. But does psychology say anything more than the writing itself suggests, and, if not, what purpose does it serve? A simpler explanation of Hofmannsthal’s literary career is probably the one Broch held before wrestling with Hofmannsthal in the context of nineteenth century literary culture: Hofmannsthal’s goal was to distinguish himself in the literary tradition most favored by the ancient aristocracy, solely because it was so favored by them. Let’s consider some additional biographical facts. First, Hofmannsthal proved himself to be politically highly conservative. This is shown by the significant fact (omitted in Broch’s essays) that during World War I Hofmannsthal not only held a position in the ministry supporting the Emperor, he also actively supported the Emperor’s war efforts with various propaganda efforts. None of the Jung-Wein and certainly none of the avant-garde displayed anything like this level of identification with imperial Austria. (Broch himself, who was managing his father’s textile manufactures and presumably would have had more economic interest in defending the existing order, took no such actions. He spent the war working with the Austrian Red Cross.) In the pre-war years Hofmannsthal’s works found acceptance by Richard Strauss and other conservatives. The New Music composers, who used verses by Stefan George (and even poets like Maeterlinck, who were less progressive from a literary point of view than Hofmannsthal) never used Hofmannsthal’s poems. Moreover, Hofmannsthal did not simply acquiesce in the conversion of his grandfather to Catholicism: His wife, though Jewish, converted to Catholicism before she married Hofmannsthal. Schnitzler was openly critical of Hofmannsthal’s rejection of his ethnic Judaism. Finally, Hofmannsthal’s own father’s inculcation of young Hugo with things aesthetic was not the “moral” duty of the upper bourgeoisie; if that were the case surely there would have been examples of others. It seems rather that it was the calculated attempt to have young Hugo regain the aristocratic prestige of the family, which faded when Hugo’s grandfather lost the family fortune in the crash of May 1873 and the subsequent Long Depression. Professor Schorske noted how the aristocracy in those days refused to admit to the life of the imperial court those who won a patent of nobility. “Direct social assimilation to the aristocracy occurred rarely in Austria.” Money itself (of which the Hofmannsthals no longer had much) was itself not sufficient. The conflict was not between ethics and aesthetics; it was between Jewish bourgeoise ethically informed aesthetics and aristocratic Catholic aesthetics. Hofmannsthal chose aristocratic aesthetics, but to the extent his bourgeois ethical-aesthetics could not be repressed, it was cast in dreamlike form. Klimt not only painted the classical theater scenes to decorate the new Burgtheater, he showed the audience of the old one. Aristocrats clamored for special sittings to be immortalized as patrons of the theater. (Shorske at 212 n.*.) The Auditorium of the Old Burgtheater. Oil on canvas by Gustav Klimt (1888) (Historisches Museum der Stadt Wien, Vienna). Of course Hofmannsthal’s rejection of social naturalism was unlikely to have been motivated by the same reason Broch himself would later reject it: its exhaustion as a form and its inability to speak to fundamental “ethical” questions. (Broch spends a great deal of effort in the first of his Hofmannsthal essays explaining his view of the history of European literary and visual art from the middle of the nineteenth century to Joyce and Kafka. The discussion is very dense and like German writing since Kant depends on the juxtaposition of opposites and their resolution. Neither Marx nor Nietzsche had been able to root out Hegel in Broch’s mental structure. I distill one strand of his thought without attempting to replicate the subtlety of his reasoning.) An aspiring aristocrat like Hofmannsthal could hardly help himself advance his cause by producing novels like Zola’s (or even those of the arch-conservative Dostoevsky for that matter, who was at least as anti-Semitic as the Austrian aristocrats, although perhaps not quite as much as the Christian Socialists whose popularity among the petite bourgeoisie rose to the mayoralty in 1897 Karl Leuger, a man later praised in Mein Kampf). Dreams were not confined to theater in the last decade of the nineteenth century in Vienna, however. Freud’s Interpretation of Dreams was published in 1899. Broch’s own fascination with dreams as both metaphor and entrance to unconscious both in literature and in his social psychology work stemmed from Freud’s work and techniques. Freud himself was undoubtedly guided in his own thinking by the dreams that were everywhere in Vienna, but that is for another story. That Hofmannsthal was goaded by ambition (isn’t ambition the very lifespring of the burgher?) and that the dream life of Hofmannsthal’s poems were not dictated by the Angel of Genius does not mean that the works are trivial. They are immediately arresting, but at the same time are composed with a subtlety that bears careful analysis. The poem today illustrates these points. The poem is named for its form: the terza rima. This form, perfected, if not invented by Dante for the Divine Comedy, is made up of three-lines stanzas where the first and third lines rhyme. The second line rhymes with the first and third lines of the next stanza, so on until the end. In this poem Hofmannsthal doesn’t interlock the stanzas in the first part, but does rhyme the first and third lines. In the final three parts the stanzas are interlocked. Everything has a strangeness, no matter how familiar. It is the nature of the “Thing.” Each Thing whether a mute dog or the full moon over the tree tops is “an uninterpretable interpretability” (as he writes in his Buch der Freunde (Leipzig: Insel-Verlag: 1922). We can understand the Thing without being able to explain it. Everyone confronts external reality, and our only connection with it is the Dream. The content of the poem (its “ethical” component in Broch’s language) suggests that the transience of life is not, as Hofmannswaldau saw it, the end of things beautiful and precious, but rather in their transformation into other Things. What relieves us of despair is the knowledge of our connection with some others by descent and all other things by physical action, like the fertilizing power of the martyr’s blood. While we may not comprehend it, Life itself is fully aware of its own logic and power. Wie eine Heilige, die ihr Blut vergießt. Are gone, forever gone, and wholly lost? Unnatural as a silent, foreign hound. Are one with me just as my very hair. Just like a martyr pouring out her blood. The waxing moon appears through darkest night. Than is the moon awaking through treetops. They are inside of us and always live. And three are one: the man, the thing, the dream. Perceives its very majesty and strength. Are yet as close to me as my very hair. As much a part of me as my very hair. Or as a saint pours out her martyr blood. The pale full-moon emerges for its flight. Not otherwise than so our dreams arise. Than the full-moon awakening on the night. Our inmost self is open to their sway. They dwell in us and have their life alway. Note on Text: You see that Stork only translates the first three parts of the poem. The reason is that he translated from the 1907 edition of the collected poems of Hofmannsthal, which did not include the fourth part. In fact, I have been unable to find a published version of the fourth part before the 1922 edition (the one I used). The publication history of the poem is somewhat curious. Evidently the first publication was in 1895 in Stefan George’s Blätter für die Kunst (Leaves for Art or Album for Art). The individual issues of this journal were circulated only among a small circle, so I cannot tell what the original version was. But the collected volume for the years 1892-1898, published by Georg Bondi in Berlin in 1899 (entitled: Blaetter fuer die Kunst: Eine Auslese aus den Jahren 1892-98) contains only the first part of the poem (on page 73) under the title “Terzinen über Vergänglichkeit.” That version is the same as Part I above, except for the idiosyncratic orthography of G. Bondi, where nouns are not capitalized, the double s is used instead of the ligature symbol ß, and a general carelessness with commas (although in this version the commas are identical to the version in the 1922 edition). G. Bondi as Verlag der Blaetter fuer die Kunst in Berlin published two editions of the collected poems of Hofmannsthal (Ausgewaehlte Gedichte) in 1903 and 1904. Those versions show the carelessness with the commas (which are represented by a middle dot). The first three parts of the poem are included in these two collections. Thereafter, Insel-Verlag in Leipzig published Hofmannsthal’s collected poems. The following version have only the first three parts (and they use the orthography as in the text above): Die gesammelten Gedichte (1907) (pp. 19-21); Die Gedichte und kleinen Dramen (1911) (pp. 14-15); Die Gedichte und kleinen Dramen (1916, stated to be the 3rd edition) (pp. 14-15); and Die Gedichte und kleinen Dramen (1919, stated to be the fifth edition) (pp. 14-15). I was unable to located either the second or fourth editions, but since the three I did see seemed to use the same plates, it’s unlikely the other two editions differed in any way. The next edition is the one I use, called simply Gedichte on the title page and Die geammelten Gedichte on the succeeding page. The poem is found on pages 26-28. Before this edition the title “Über Vergänglichkeit” is placed under the Roman I. In this edition the title comes first and is the title for the complete four part poem. 6J.D. McClatchy, The Whole Diifference: Selected Writings of Hugo von Hofmannsthal (Princeton University Press: 2008), p. 4. 13Broch at 4 (Steinberg’s introduction). An excellent side! Please, don’t give up!